The Leap Motion Controller senses how you naturally move your hands and lets you use your computer in a whole new way. Point, wave, swipe, reach, grab. Pick something up and move it or just tap. The Leap Motion Controller doesn’t replace your keyboard, mouse, stylus, or trackpad. It works with them, and without special adapters. With the Leap Motion software running, just plug it into the USB on your Mac or PC, and you’re off. 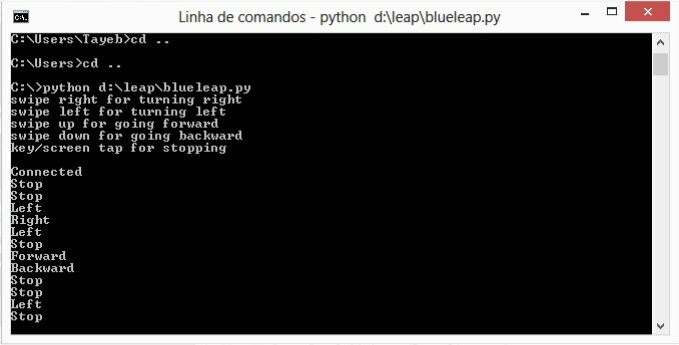 Control a robot with gestures on the air with Leap Motion controller, using bluetooth to comunicate between the PC and the robot. You need first of to install Python in your PC. You will need to install PySerial and Win32com.Client modules. Once duly installed you are ready to write the Python code. print "swipe right for turning right"
print "swipe left for turning left"
print "swipe up for going forward"
print "swipe down for going backward"
print "key/screen tap for stopping"
#print "Press Enter to quit..."
The gestures used here are swipe left, swipe right, swipe up, swipe down and tap. A video showing the robot being controlled by Leap Motion controller with swipe gestures and tap will be made soon and published here. Controlling a device (in our case a robot) through gestures on the air, is quite an interesting endeavor. In fact it is quite easy to control a device with Leap Motion controller. 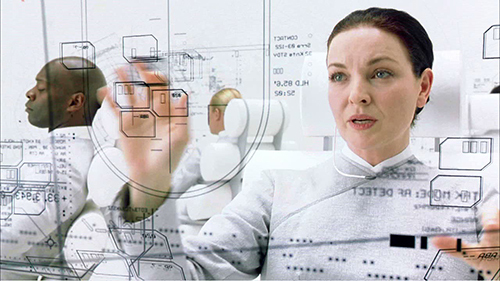 With little more coding and refining our strategy, we can ensure that right commands are sent every time to the device, through gestures on the air, and those commands are not misinterpreted by the Leap Motion controller. This entry was posted in Robotic Projects and tagged 8051, Bluetooth, Control, Gestures, Leap Motion, Minority Report, Python, Robo-51, Robot, Zx-Bluetooth. Bookmark the permalink.